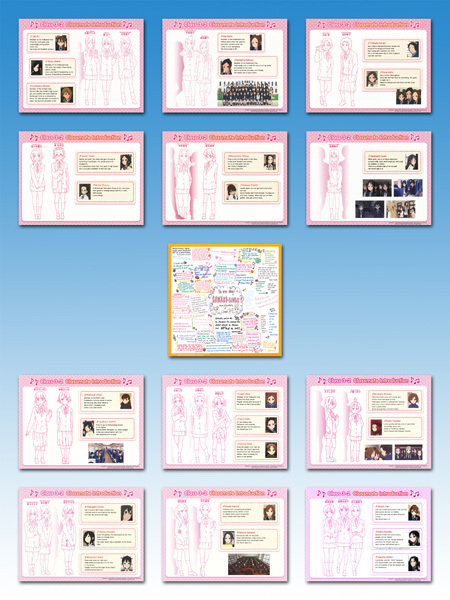 This is the complete set of classmate introductions from anime season 2 omake. It includes previously released Vol.1-9 (with a few minor revisions) and newly translated Vol.8 bonus page (the card everybody signed for Sawako, as seen in ep.24). Thank you for uploading these! And thank you especially for uploading the thank you card, it looks great! I always found the background characters to be interesting, and it’s nice to know that KyoAni put effort into making cards for them! …at the same time, I’m also in awe with how Kyo-Ani manage to create 30+ classmates each with their own characteristic. Especially the valediction card is very nice^^. im surprised that the author would give details about characters that are barely shown. Thanks so much! I loved the Sawa-chan card! Also, what’s up with the “10’ks”? I mean I know it says “Thanks”, but is this a thing now? Have I been wasting all my time signing years books the old fashioned way by spelling out “T-H-A-N-K-S”, when I could have been doing a much cooler job signing them “10’ks”?!? How long has this been going on!?! In the original Japanese it was written as ????? and one of the Japanese words for “10” is “too” (to-oh), so the whole thing can be read as “arigatoo” (a slight misspelling of “arigatou” which means “thanks”). I really wanted to keep the “10” in my translation somehow and “10’ks” was the best I could come up with. And wow… you did a really great job on Sawako’s card. It must be difficult on how to convert their writing from Japanese letters while still preserving their styles. Thank you, the card looks great!